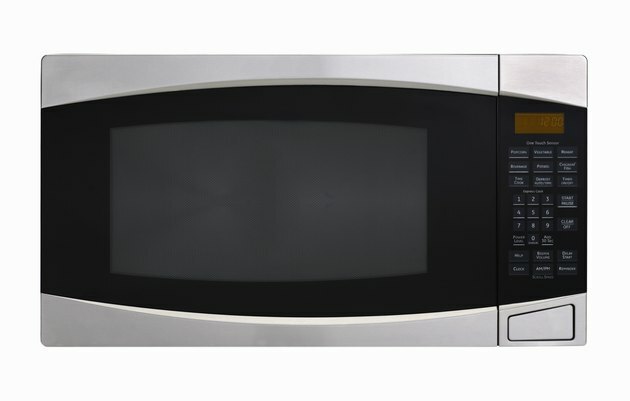 Cleaning a microwave touch pad is often tricky because the cleaning pressure could turn the appliance on. This can damage this handy appliance over time and affect its safety. Cleaning the microwave exterior keeps it looking aesthetically pleasing. If grimy residue builds up on the touch pad, it could affect how well it operates and cause you to repeatedly punch the numbers to make it work correctly. Touch pads are often available even on inexpensive microwaves. Open the door of the microwave. This prevents the appliance from turning on while you are cleaning the touch pad. Wet a cleaning sponge with warm water and wring it out well. Spray the sponge -- not the touch pad -- with the all-purpose cleaner. If you spray it directly on the touch pad screen, the liquid could seep into the unit and cause damage. Wipe the touch pad thoroughly with the sponge. Pay careful attention to any corners of the screen that might be particularly soiled. Rinse the sponge well and wipe off the touch pad screen to remove any cleaner residue.